Toronto-based Carrot Rewards has announced launch of its new ‘Step Together Challenge’ platform, which it says is the world’s first peer-to-peer rewards for physical activity. Since March 2017, the free Carrot Rewards app encourages users to walk more by offering points for participating programs like Aeroplan Miles, SCENE and Petro-Points each time daily step goals are met or health-related quizzes are completed. 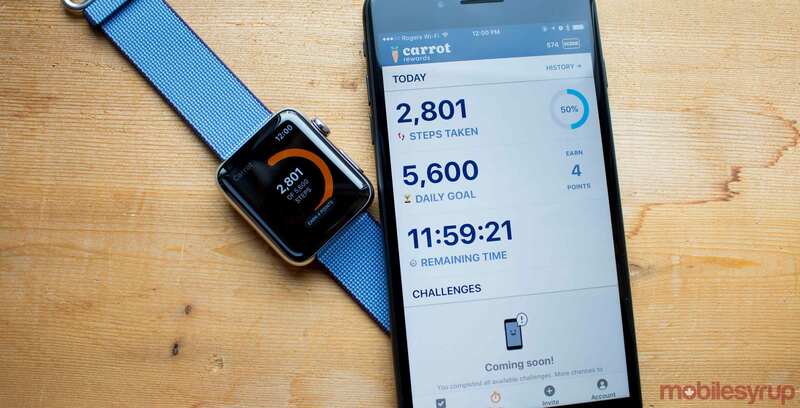 With the new in-app Step Together Challenge, Carrot aims to further promote physical activity by allowing users to achieve their daily step goals and earn rewards alongside their friends. The Step Together challenge is available to all users and lasts for seven days and requires the pair to reach 10 goals during that time. The goal isn’t to have users compete, however, but instead encourage each other to meet their own individual targets. To further entice users, Carrot is also offering double reward points for the next two weeks to all users who try the new feature. According to Carrot, users of the app demonstrate an “unprecedented” 20 percent average increase daily physical activity. Carrot says the Rewards app has reached nearly one million downloads since its release in March 2017. Carrot Rewards was also voted ‘Best Canadian-developed App’ by MobileSyrup readers at the end of 2017.